Lock in a great price for Taos House – rated 8.3 by recent guests! I’ve felt very well attended by the staff over there. The lady was very good helping me renting bikes or booking tours. The room and bathroom were clean, cozy and relaxing. The breakfast was good. The swimming pool was also great. The Pick up and Drop off services were exceptional. Great staff. Amazing coffee. Good breakfasts. We ended up spending more time in the hotel than planned as the weather was too bad for us to go on our intended scuba diving trip. The hotel was excellent. 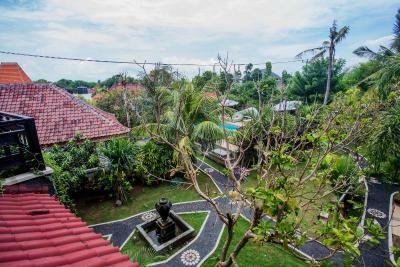 We enjoyed the pool and our rooms were spacious and comfortable with excellent AC and fans. The cool and helpful staff. Also very close to the best dining place on the island, L.GOOD. The pool was nice and clean, the room was good and the AC worked. Also it is a very quiet place and good for a family. Very Kind staff, very helpful with all matters. We can definitely recommend the place. Ideal if you want to visit multiple destinations around the west coast. Taos House This rating is a reflection of how the property compares to the industry standard when it comes to price, facilities and services available. It's based on a self-evaluation by the property. Use this rating to help choose your stay! 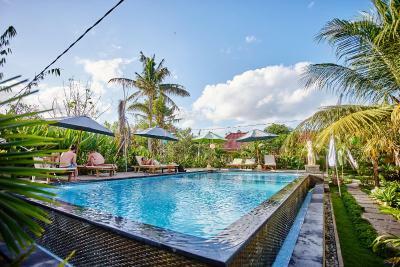 Featuring a free WiFi in all public areas and a garden with an outdoor pool, Taos House offers rooms in Lembongan, a 5-minute walk from Mushroom beach. Massage can be organized on site and free on-site parking is available for guests who drive. The property also offers free harbor transfer. 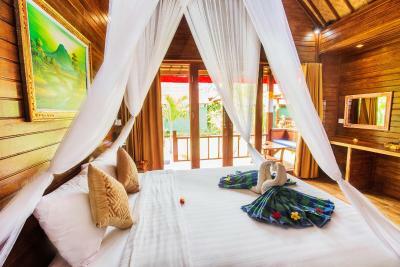 With pool views, each room comes with a wardrobe, seating area and a desk. 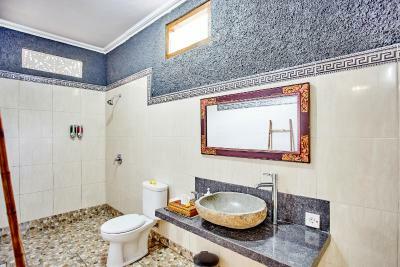 A shower and free toiletries are included in the private bathroom. 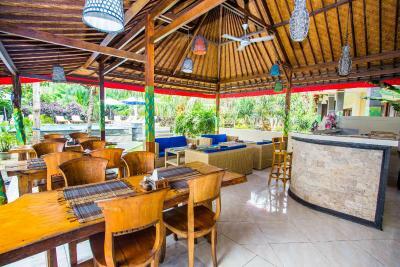 Taos Restaurant serves Indonesian and Western cuisine. A savory breakfast is offered daily and includes hot drinks, pastries and cold meats. 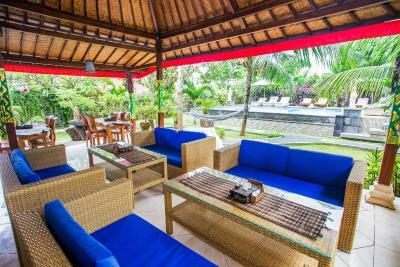 The friendly staff can help guests to arrange motorbike hire. The property is a 30-minute boat ride from Sanur Bay. Blue Lagoon is 3.1 mi away. 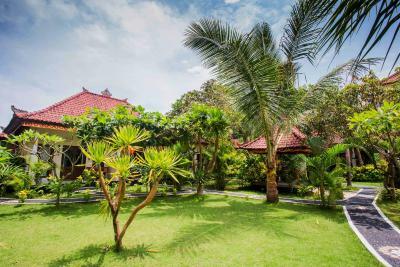 Nusa Ceningan Island is reachable within a 10-minute motorbike ride away. When would you like to stay at Taos House? 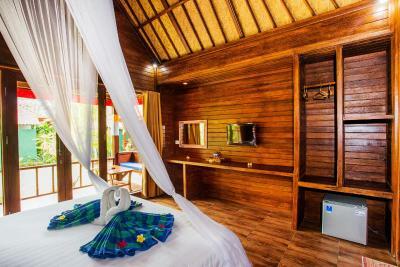 With free Wi-Fi, this air-conditioned room comes with a wardrobe, seating area and a desk. 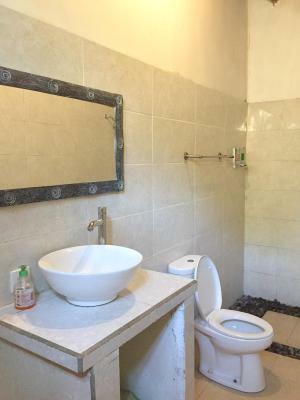 A shower and free toiletries are included in the private bathroom. 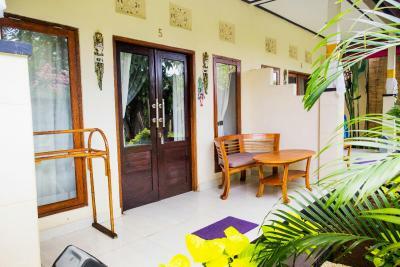 With free Wi-Fi and offering views of the garden, this air-conditioned room comes with a wardrobe, This double room has a balcony, mini-bar and electric kettle, seating area and a desk. 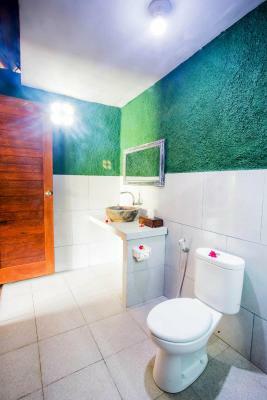 A shower and free toiletries are included in the private bathroom. 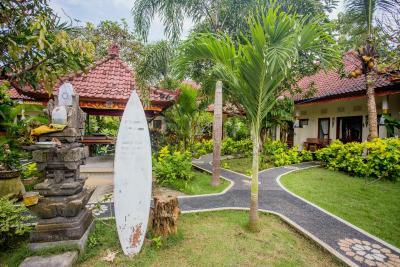 taos house is small house with local lembongan family run the house. employing young people villager and hospitality traning for deliver service from heart. House Rules Taos House takes special requests – add in the next step! Great staff, super kind people and helpful ! Nothing really around the area.. Bathroom was outside and no hot water. Pool was right by the road so not relaxing. The door to our villa was damaged. Occasionally felt we were in the way at breakfast, not the most welcoming hospitality. It was very dirty and bedsheets were not changed. Very small wardrobe and awful bathroom with dirty and old toilet and shower was not working properly as well as drenage was not letting water to go. All over disgusting room which is not clean at all and the only way of cleaning the room is making up ur bed and thats it. The only proper thing in whole place was the pool and location and thats it. Price was it was ok but quality wise not really good. 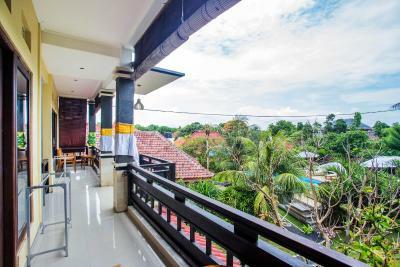 Really good value for money, excellent location only 5 mins walk from Mushroom Beach. Staff were all really friendly and whole place had a nice laid back vibe. 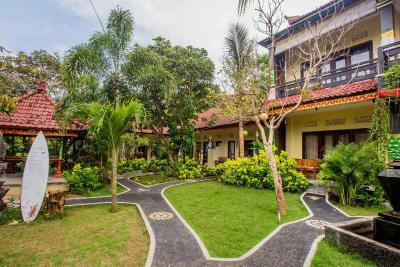 I had a really great feeling about the place and enjoyed my stay. The staff were always very helpful. breakfast was not enjoyable and very basic. Pool and bungalow we stayed in was nice. The young man on reception when we left was excellent the day we left made phone calls on our behalf to ferry operator. Bathroom area could do with a slight refresh, and we seemed to run out of water one night. Bed wasn't the comfiest we've had but still slept ok! Lovely staff only too happy to help with things, they helped us book transfers each way and organized our snorkeling trip! Very nice pool and pool area. Handy that you can hire scooters and buggys from them too! Good location, only 5 ish minute walk to Mushroom beach. Bathroom could have done with a bit of love and water was salty. Clean, quiet, spacious, good breakfast and value for money. 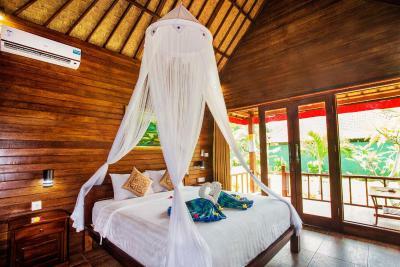 Mosquito net was provided, although unsure it was truly needed, and was fitted well to the bed. Staff shuttled us on departure.